I went into Pizzaria Stella with one thing on my mind. The Tartufo Pizza. 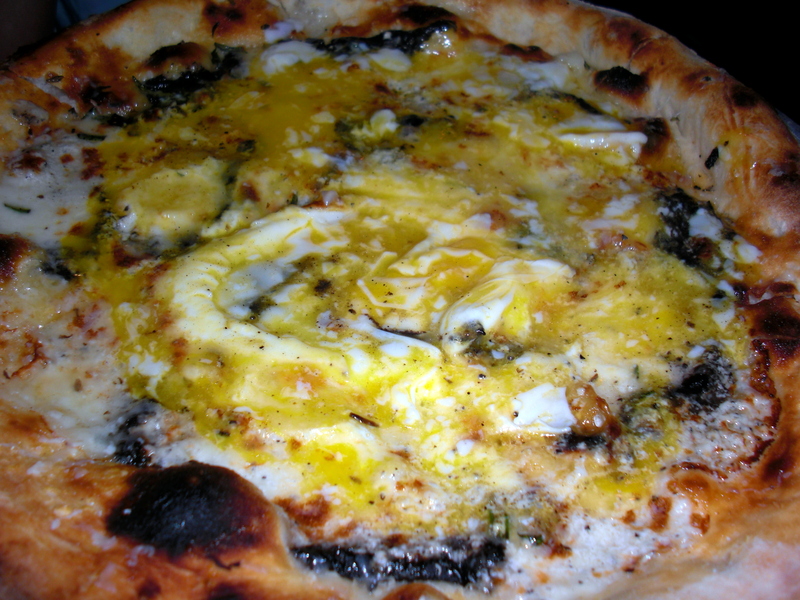 Black truffle, fontina, egg, parmesan on a crispy food fired crust. When it arrived, the egg, raw but intact, sat atop the pizza and the waitress deftly broke the yoke, swirling it across the cheese. It was a nice touch, especially with the salty truffle, though as the pizza cooled it became less impressive. A friendly selection of wine and beer (I had the house read, a perfectly serviceable Montepulciano d’Abruzzo). The menu includes numerous vegetarian options (though don’t expect anything vegan) and homemade gelato that won’t blow your socks off, but won’t disappoint you either. This is a bustling place, with closely spaced tables that are almost always full. Though the lighting is dim, it’s too loud to be romantic, but would work well as a fun evening out with friends. While the service is perhaps too helpful (don’t let them rush you out) you won’t ever be ignored, either. Stella, Steven Starr’s newest addition to the Philly restaurant scene suffers, if anything, from the same mild disappointment of most Starr joints – great concept, but you’re left feeling that you paid a bit too much for the experience. hmmm. you know i love eggs, but did breaking a raw egg on top lead to a soupy sort of pizza or was it still hot enough to partially solidify? a little of both. The spread the egg out over the entire pizza, so it partially solidifies, but I think the pizza could have been hotter. The crust is very crispy, so that helps. But yeah, its odd.